A field experiment was conducted during the two successive seasons of 2012/2013 and 2013/2014 to explore the effect of compost/NPK and biofertilization treatments on essential oil, photosynthetic pigments and herb NPK content of fennel plants. 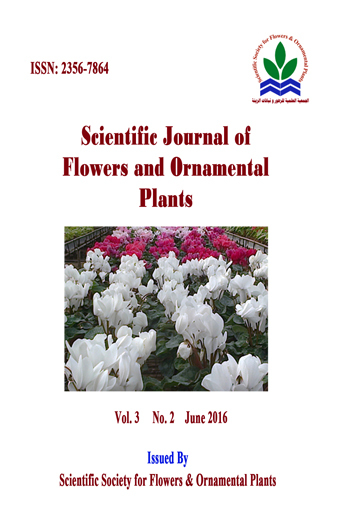 Obtained results revealed that the best three essential oil characteristics (essential oil %, essential oil yield per plant and per feddan), photosynthetic pigments (chlorophylls a, b and carotenoids) and herb content of N, P and K values were obtained due to the use of the full dose of mineral NPK, ¼ compost + ¾ NPK dose or ½ compost + ½ NPK dose with no significant differences being detected between such three fertilization treatments. Concerning biofertilization treatments, all of the prementioned essential oil determinations, photosynthetic pigments and herb NPK content traits were considerably augmented due to the dual treatment (Minia Azotein + phosphorein) followed by Minia Azotein, while phosphorein gave the least values. In regard to the interaction gave between the, two involved factors, the highest volatile oil determinations and chemical compositions values were given by fertilizing fennel plants with the full dose of mineral NPK, 25% compost + 75% NPK or 50% compost + 50% NPK in combination with dual biofertilizer treatments (Minia Azotein + phosphorein). It is recommended, to supply fennel plants with 50% compost + 50% NPK in combination with the dual biofertilization treatment (Minia Azotein + phosphorein), from the environmental and economical point of view, in order to maximize the fruit essential oil productivity.